There is an Egyptian tale where seven Hathors are disguised as seven young women linked with fortune-telling and the Land of the Dead. They may have been associated with the Pleiades in later times. Hathor herself was known as Lady of Stars, in connection with the star, Sirius. Hathor is often seen carrying a sistrum, an ancient musical instrument played by priestesses in sacred temples. The sistrum is thought to have overtones relating to sexuality and fertility. 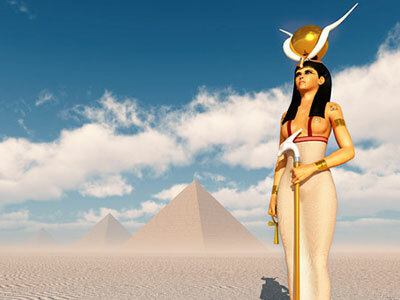 For me personally, Hathor is most prominently a goddess of healing, who emanates love and healing light from her hands. The first time I connected with Hathor’s energy I was reading a book about ancient Egypt. I felt a warmth moving closer to me and to my heart. Then, I was guided to raise my hands, palms facing outward and I sensed her hands and palms facing mine. A glow of golden light flashed before me and I felt a warm sensation entering my palms and almost as though my hands were being supported and held and all time was suspended. As I connected with Hathor, she conveyed to me that time is merely a concept. There is no such thing as ‘time’ in the absoluteness of the Infinite Light, which is why we can draw upon it for unlimited healing and creation. The subject of magic is commonly associated with ancient Egypt and highly sought out by many metaphysical seekers and initiates, in attempt to tap into the powers behind the great ancient mysteries and magic. Though Goddess Isis is most often referenced with Egyptian magic, I’ve found a magic while connecting with Hathor that is uniquely different than I’ve come upon in my research of Celtic, Norse, and other traditions. Hathor teaches me through experiences, not necessarily through thoughts, and seems to possess a magic that transcends time. From what I’ve seen she creates miracles and opens the mind to expanding awareness. She has shown me that all things are possible when we come completely into the now moment, where there is no time, no past, no future, just a continual now, or present. Hathor has also shown me there is something galactic, beyond our understanding, that could never be translated down into language and that when we return to the now moment, the greatest gift awaits us and that all magic is found here. Known as The Psychic's Psychic, since 1998, Isadora has read for thousands all over the world, her impressive list including clients from the Obama administration, Fortune 500 CEO's and notable names in Hollywood. Her detailed (Gemini) accuracy is nothing short of astounding, with her ability to see people at the Soul Level and clearly answer questions on a wide range of subjects, from relationship matters, business decisions, to past lives, etc.—anything that requires clear answers and pin-point insight. She has the ability to identify hidden patterns that run beneath your current situation, providing you with information to positively change your future. If you'd like a reading with this compassionate, straight forward, laser-accurate and dedicated Psychic, you can find Isadora at PsychicAccess.com.